Canadian director Brad Peyton’s homage to American patriotism is brilliantly captured in the Hollywood blockbuster San Andreas starring Dwight Johnson (Hercules), Paul Giamatti (12 Years a Slave) and Carla Gugino (Sucker Punch, American Gangster, Sin City). California literally splits in two in San Andreas as the fault line which separates Nevada and California erupts and causes a mammoth series of earthquakes along the entire San Andreas fault from the Hoover Dam in Nevada right to Los Angeles and up to San Francisco, where the film echoes the devastating 1906 earthquake which rocked the Bay area. Audiences should not expect any intelligent dialogue, with possibly the best lines being spoken by seismologist Lawrence played by Paul Giamatti (Sideways) and tough News reporter Serena played by The Good Wife star Archie Panjabi. San Andreas focuses on a broken nuclear familiar whose own personal fault lines mirrors that of those which occur naturally. Dwight Johnson and Carla Gugino play a couple, Ray and Emma on the verge of divorce and she has met a shady smooth talking property developer Daniel Riddick played by Ioan Gruffudd (Amazing Grace, The Fantastic Four). The San Andreas fault brings epic chaos to the entire state of California and like most natural occurrences which bring a family together, this film is a familial drama set within a broader context of a national American tragedy played out on the big screen with spectacular visual effects. Whist the storyline and plot are certainly contrived, San Andreas relies heavily on stunning visual effects as all the characters play second fiddle to the earth erupting around them and complete obliteration of some of California’s most iconic landmarks including the Hollywood sign above Los Angeles and The Golden Gate Bridge. 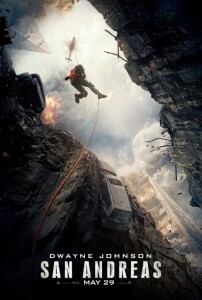 This is a disaster film with a massive budget and audiences will certainly not be bored by the fantastic aerial shots of the San Francisco bay area rippling under the weight of a massive earthquake and ensuing tsunami. San Andreas is the 21st century answer to The Towering Inferno. Watch out for a doomed cameo by Australian pop diva Kylie Minogue who plays a bitchy L. A. blonde, Susan Riddick. Australian actor Hugh Johnstone-Burt and Alexandra Daddario play the young beautiful couple Ben and Blake who manage to survive all sorts of treacherous earthquake related events including being trapped in a newly built skyscraper known as The Gate, situated in San Francisco’s posh Nob Hill suburb. 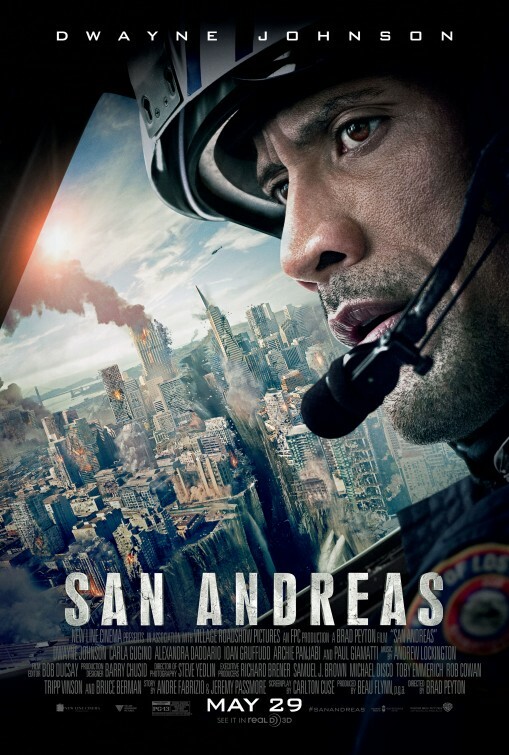 San Andreas is a spectacular show and is recommended for audiences that enjoyed films like Poseidon, although at times it’s a bit too heavy on its American patriotism, especially when everything will still be peachy despite too major cities being completely obliterated. The main thing is that all the wholesome characters survive the earth shattering ordeal relatively unscathed.